This article describes BibleMesh’s approach to the Greek verbal system, particularly as advanced in our Greek courses. Building on the insights of D. S. Bhat, who argues that languages can give prominence to either tense, aspect, or mood, Ellis, Aubrey, and Dubis argue that the morphology of Greek provides important evidence that Greek is an aspect-prominent language, though one that also incorporates tense within the indicative mood. Aspect can take three distinct forms in Greek: perfective, imperfective, and combinative. Aspect describes a situation’s internal temporal structure. For example, “he ate” is perfective in aspect, being presented as a simple whole, with no reference to anything that happened between the initiation and conclusion of the event. By way of contrast, “he was eating” is imperfective, describing a situation as being in process. “He has eaten” is combinative, describing a complex situation in which a perfective event (“he ate”) leads to a situation with ongoing results or relevance (e.g., the resulting relevance of having eaten previously may well be that no additional food is presently needed). Note that the combinative subjunctive and optative are left blank since they do not appear with distinct grammaticalized forms. The above chart displays that regular perfective forms share a σ (or sometimes a κ, as with the “kappa aorists”); this σ is an “aspect marker” for perfective aspect (not a tense formative!). The imperfective forms share an unmarked lexical core (though in the μι conjugation, imperfective forms are explicitly marked by reduplication, e.g., the δι in δίδωμι). Ellis, Aubrey, and Dubis dub the final aspect as “combinative” since it derives from a typical combination of imperfective and perfective aspect markers (both reduplication as an imperfective aspect marker and a κ as a perfective aspect marker). Since these combinative forms describe a past completed action with ongoing results or relevance, this morphological combination of aspect markers is not surprising: the past completed action is naturally referred to by the perfective aspect marker and the ongoing results or relevance of that completed action are naturally referred to by the imperfective aspect marker. In each of the three aspects, the lexical core along with its aspect markers constitute the aspect stem. Thus all of the forms of λύω in the chart above can be broken down into three aspect stems: the perfective λυσ, the imperfective λυ, and the combinative λελυκ. With the inclusion of an augment, the indicative forms of these three aspects subdivide into past and non-past forms. Thus aorist and future indicatives are both perfective, present and imperfect indicatives are both imperfective, and perfect and pluperfect forms are both combinative. The full article applies this aspectual analysis in greater depth to μι conjugation verbs as well as middle-passive forms (which, following Carl Conrad, are viewed as a single voice encompassing both middle and passive functions, so that Greek has only two instead of three voices). The significance of this article is at least twofold. 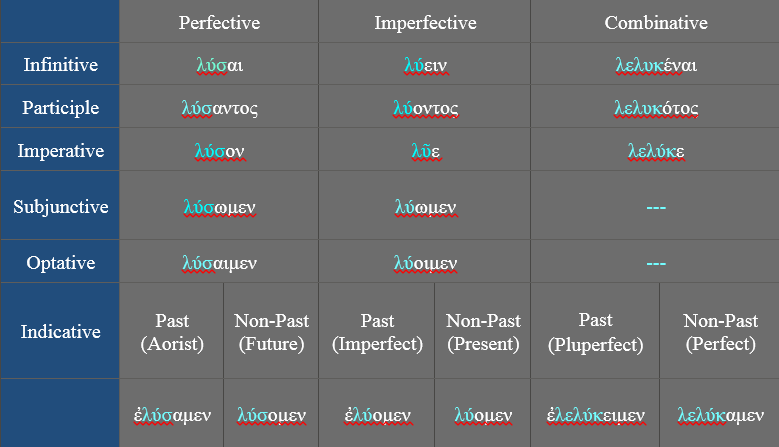 First, Greek grammar has a simpler organizational structure than that which appears in traditional Greek grammars, and a realization of this (and a corresponding restructuring of Greek paradigms) makes Greek easier for professors to teach and easier for students to learn. Second, some traditional grammatical labels misconstrue the true structure of Greek, particularly those that treat Greek as though it were, like English, a tense-prominent language (e.g., the use of “present” outside of the indicative mood or the use of “tense formative” for morphemes that are really aspect markers). Consequently, we need to reform our descriptive labels and our general conception of Greek accordingly. In doing so, we will see the simplicity and beauty of the Greek verb for what it is and, more importantly, we will be better equipped to interpret the message of the New Testament without imposing the alien constraints of our own language upon it. Nicholas J. Ellis, Michael G. Aubrey, and Mark Dubis. “The Greek Verbal System and Aspectual Prominence: Revising Our Taxonomy and Nomenclature.” Journal of the Evangelical Theological Society 59/1 (2016): 33–62. To see descriptions of BibleMesh’s Greek courses, go to https://biblemesh.com/course-partner/biblical-languages-courses.